Any way you spell it, Mom is the best with our Personalized T-Shirts. Mom is sure to love her unique Mother's Day gift from her busy little butterflies. Your Mother's Day Persoanlized Shirt is available on our premium white 100% cotton Personalized T-Shirt, machine washable in adult sizes S-3XL. Mom shirt is also available in Pink. Includes FREE Personalization! 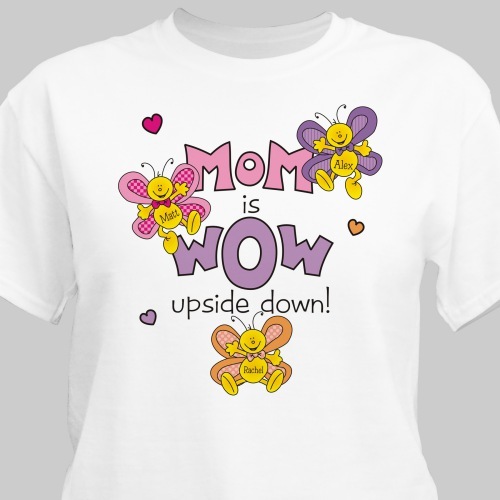 Personalize your Mom T-Shirt with up to 30 names. Each name is printed on its own butterfly. Very nice. This is going to my daughter from my grandchildren.